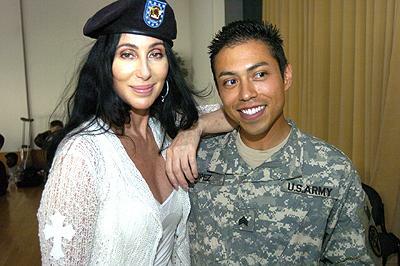 Cherilyn Sarkisian (better known as Cher; born on May 20, 1946) is an American actress, singer, songwriter, author and entertainer. She has won an Academy Award, a Grammy Award, an Emmy Award and three Golden Globe Awards. She is well known for her deep contralto vocal range. 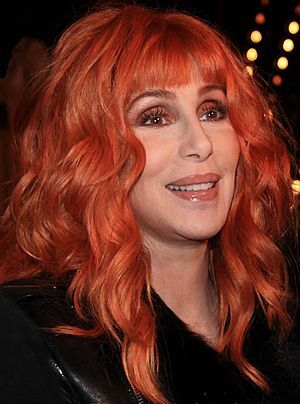 Cher first became well known in 1965 as one half of the pop/rock duo Sonny & Cher. She has also released 25 albums as a solo artist, and has 22 Billboard Top 40 entries over her career. These include twelve Top 10 singles and 5 number one singles. 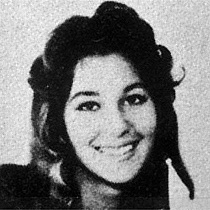 She became a successful television star in the 1970s, and a movie actress in the 1980s. In 1987, she won the Academy Award for Best Actress for her role in the romantic comedy Moonstruck. Cher Facts for Kids. Kiddle Encyclopedia.